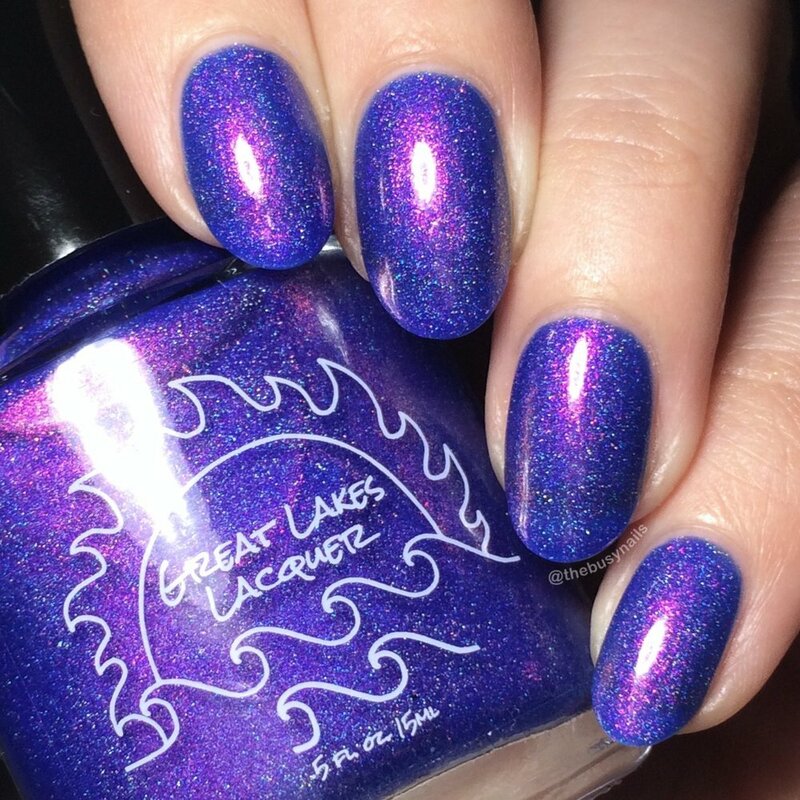 The Great Lakes Lacquer Holiday Collection is a limited edition collection of 4 beautiful polishes based on The Little Match Girl by Hans Christian Andersen, a very sad, but very beautiful short story. Pricing after that will be $45/collection and $12/each polish. The gray of a stormy winter sky linear holographic, touched with shimmer shifting from purple to blue and orange. GREAT formula on this polish. The holo is interesting - it's dense, but not strong if that makes any sense? Up close, this appeared to have teeny tiny speckles, but I think that's just the shimmer when the light isn't hitting it. I love greys, especially ones with a hidden surprise, so I'm a fan of this one. My color of warmth; magenta base filled with red, purple and gold shimmer touched with a scattered holographic finish. This color is SO rich! Per Mariah's suggestion, I went in for two coats instead of just one, even though you could one-coat this baby if you try. Two coats really deepened the color for a very saturated, vibrant end result. Great formula, as usual. Joy and love; a soft purple linear holographic with shifts of blue, pink, bronze, orange and green. This polish is purposely a bit more sheer than others in order to let the shimmer shine bright. The first thing in my notes for this shade is simply, "OMG.". Very accurate! This shade was very tricky to photograph for color accuracy, so although I've color corrected to get it as close as possible, I highly recommend viewing other swatches of this and the next shade. With that said, it's the most lovely, fun shade of purple. It's blue-leaning, but absolutely not blue or even blurple. The shifting shimmer that can pull blue or pink can trick a camera or even your eyes, but trust me when I say all purple-lovers need this one! 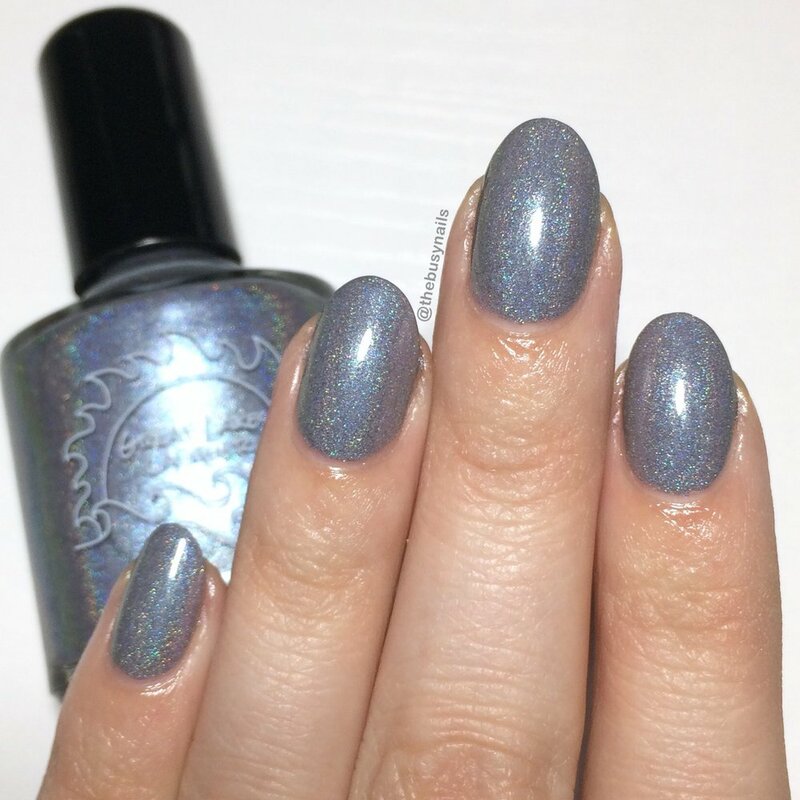 A royal blue soft holographic filled with shimmer that shifts from magenta and red to bronze to green. This polish is purposely a bit more sheer than others in order to let the shimmer through. Bold, bright and VERY beautiful! I love how Mariah captured the last part of the short story that inspired this collection. The bold royal blue base contrasts so beautifully with the strong, glowing shimmer. I used three easy coats for this swatch and was really happy with the result. I don't know what else to say about this shade since I feel like it speaks for itself in photos. If your screen is pulling purple for the base, that's wrong. The base is true blue, but the shimmer can make it pull purple sometimes. She was a real treat to photograph. Which is your favorite? I'm so torn because Mariah included so many things I love in this collection: a magenta/berry shade, blue, grey and LOTS of shimmer! For me, it's a tie between A Warm, Bright Flame (I chose this to wear for my own Thanksgiving mani!) and The Cold Hour of Dawn, but they're all amazing and coordinate really well together.